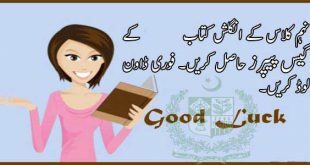 Board of Intermediate and secondary education 11th class students who are preparing for the examination or looking for the English guess paper of 11th class as per their stream to get more better preparation for the examination to increase the chances of obtaining good marks in the examination. For helping in students preparations of the examinations we have given the 1st year English Guess paper 2019. So must read the article carefully and download the guess paper 2019 1st year english below. Every year thousands numbers of students are take part in the examination of 11th class. Last year more then 1 lakh students were appeared in the examination of 11th class. This year also in lakh of counting students are ready to participate in the examination. We shearing 1st year all subjects guess papers for the students which is prepare after deep analysis of previous past papers of five years. If any student inquisitive/want guess paper and model paper 2019 of any class(9th,10th,1st,2nd,etc), then please bookmark or save this webpage. Ilmkiweb team daily update & published new guess paper this webpage. how to represent a paper in a best way? Like Seriously ? Was that a joke or tip? ? We are try our best. Please Sent Me Sotries …………………..
Can you send me the maximum most importent storys and letters of fist year now.